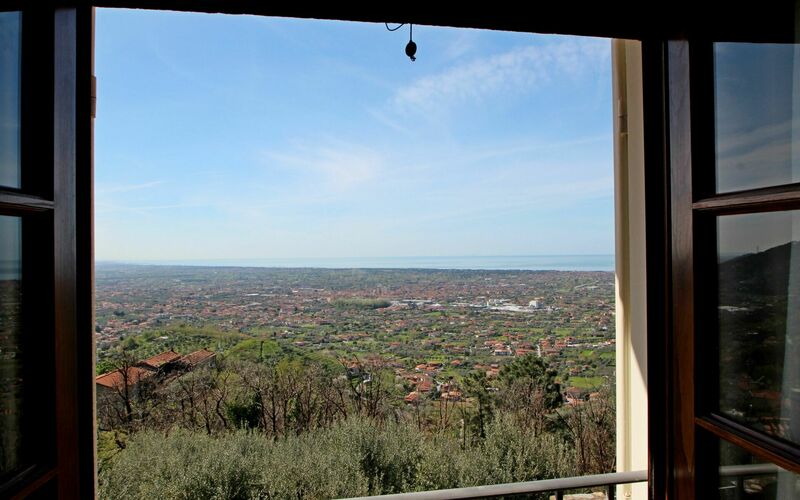 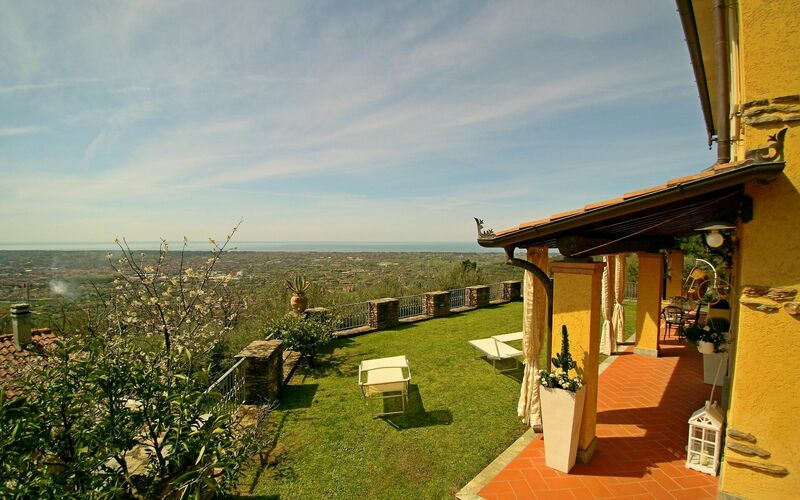 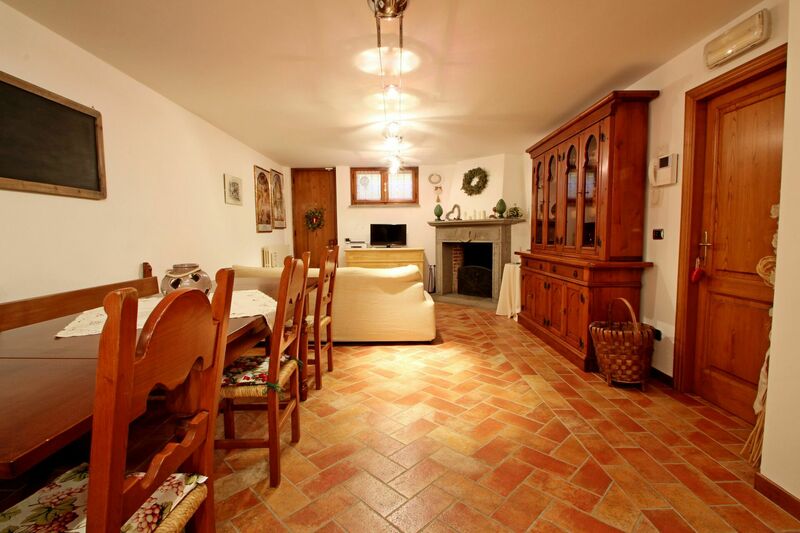 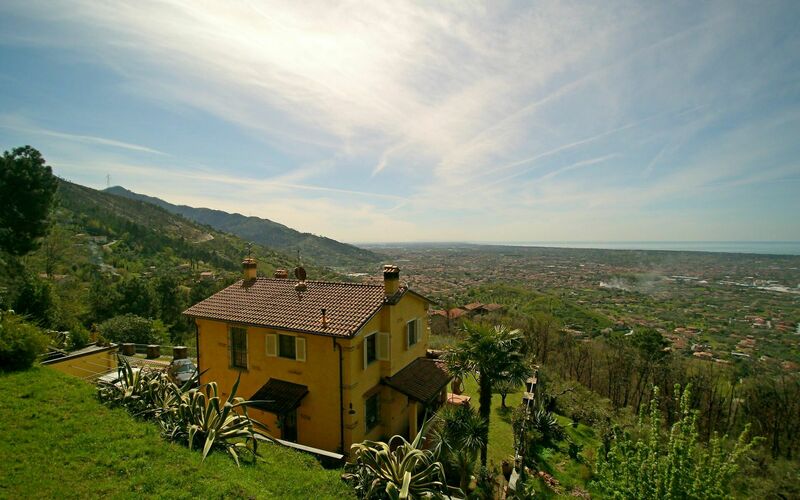 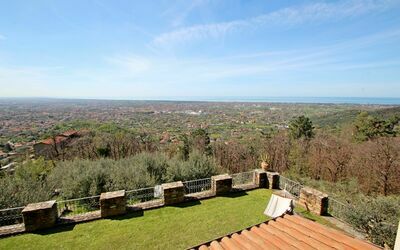 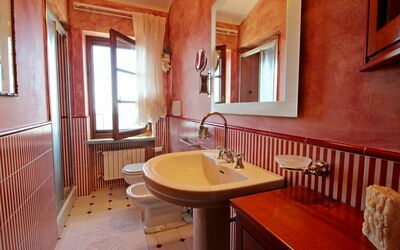 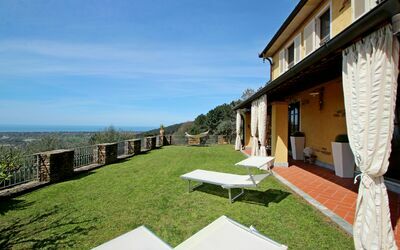 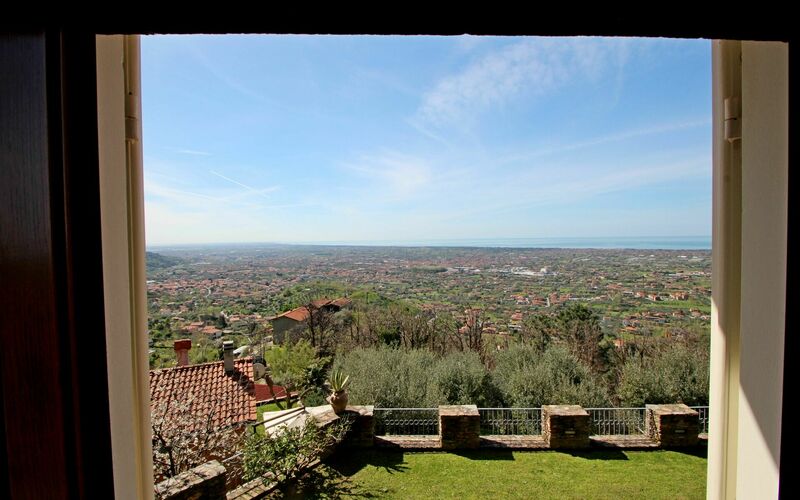 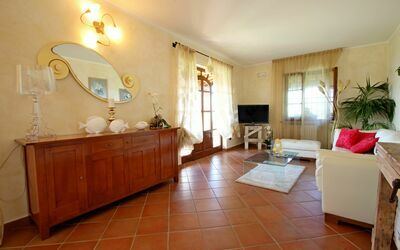 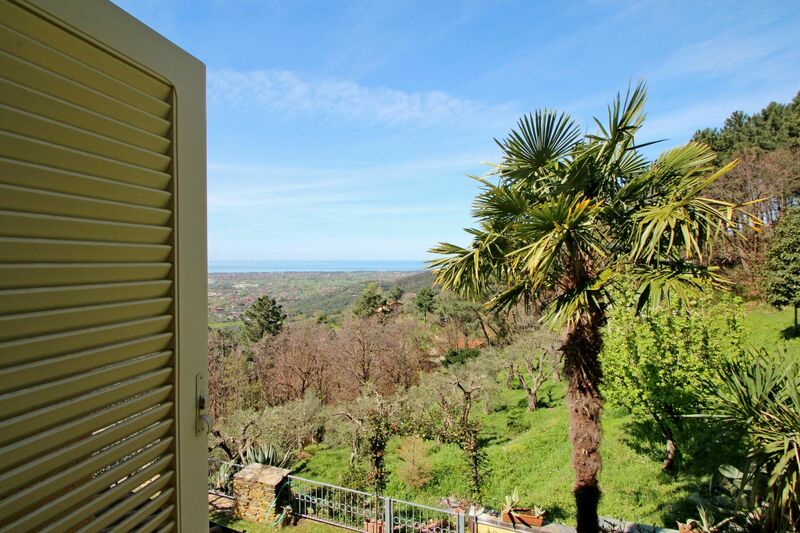 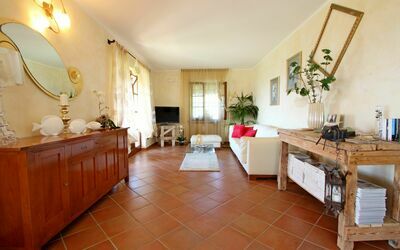 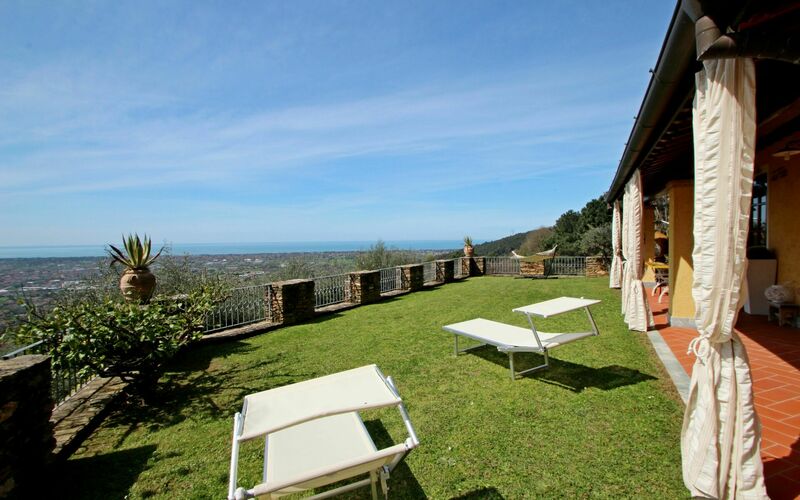 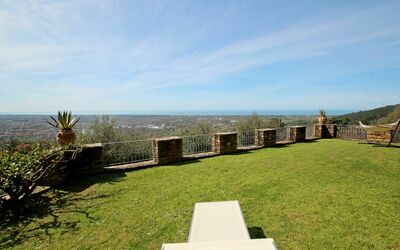 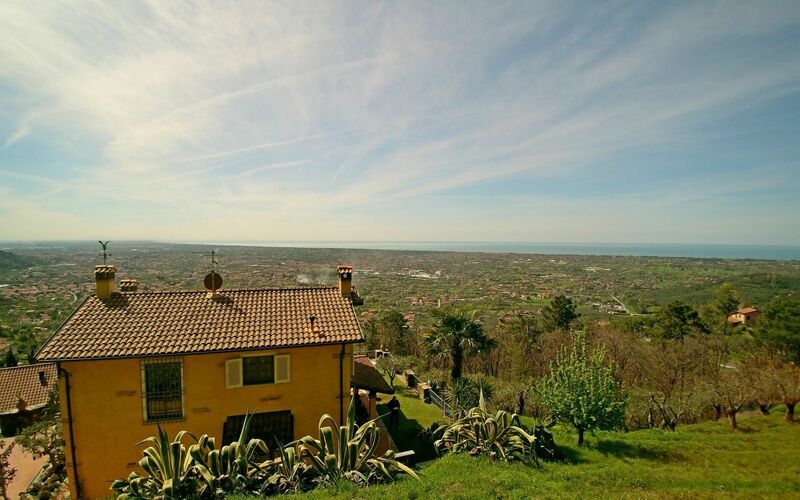 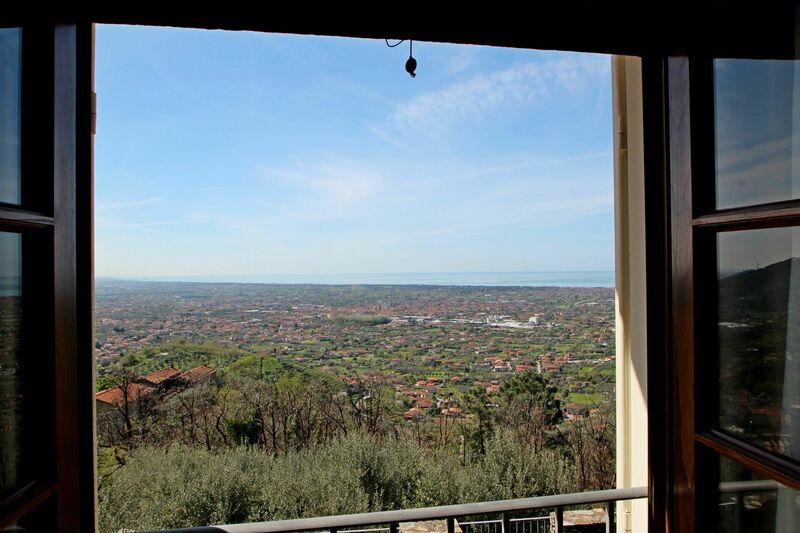 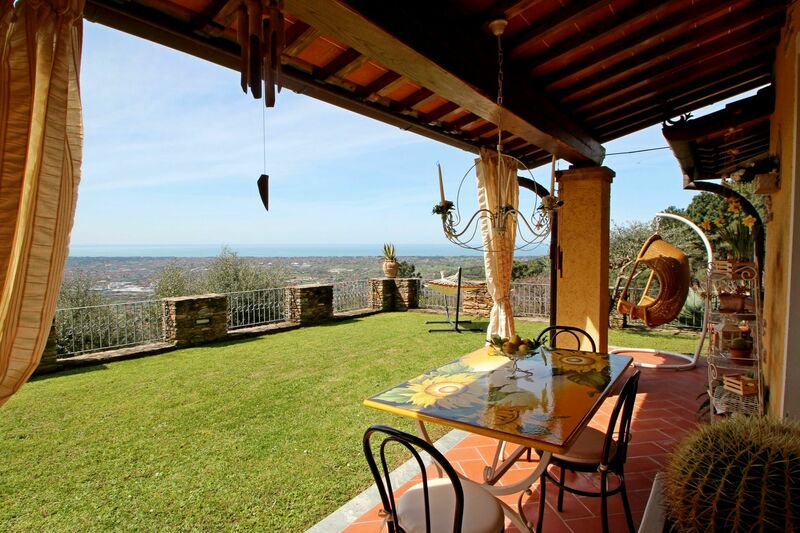 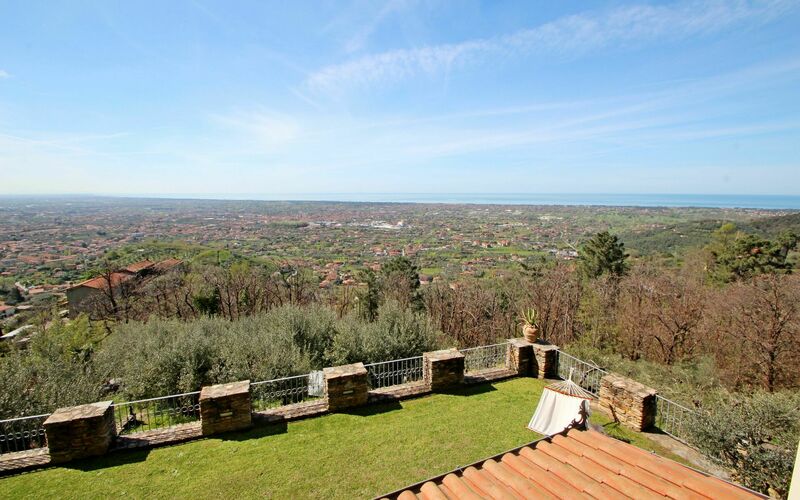 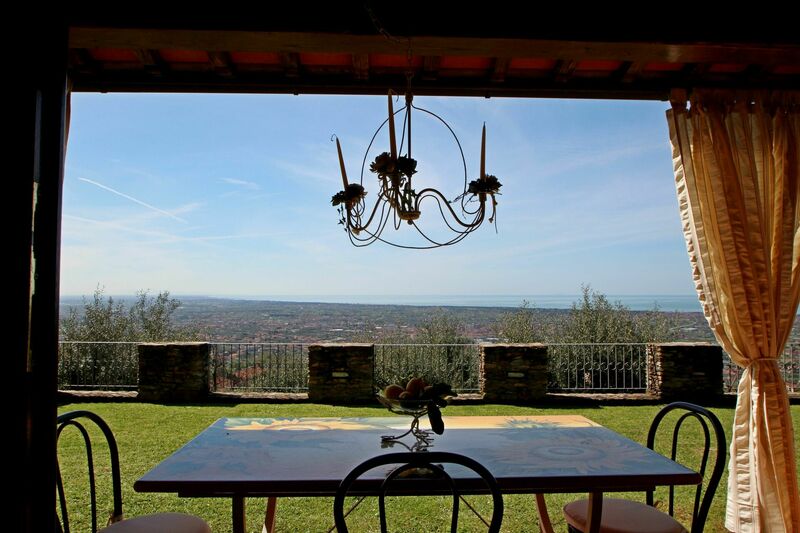 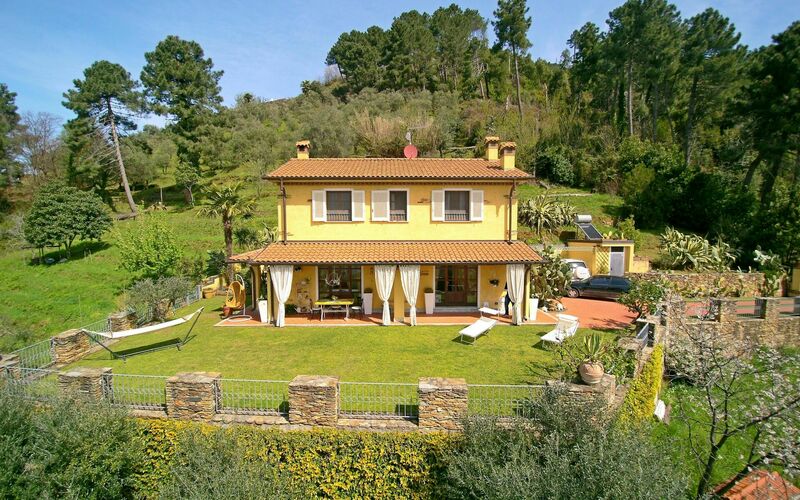 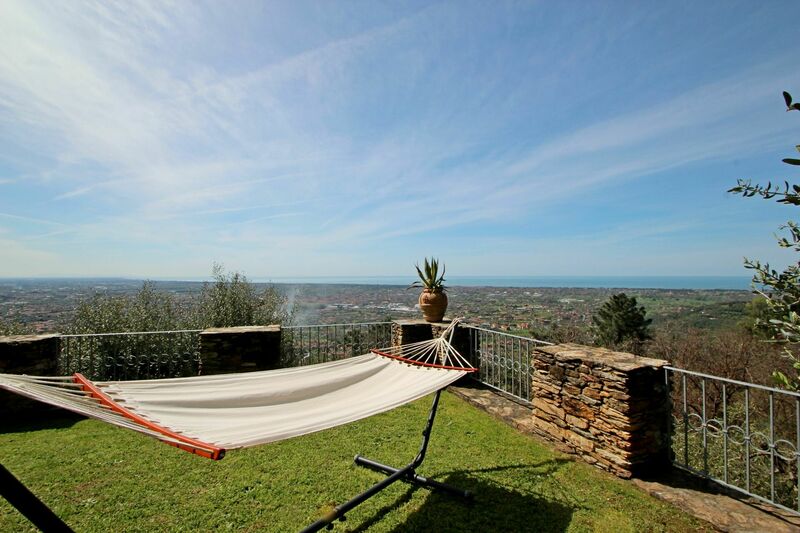 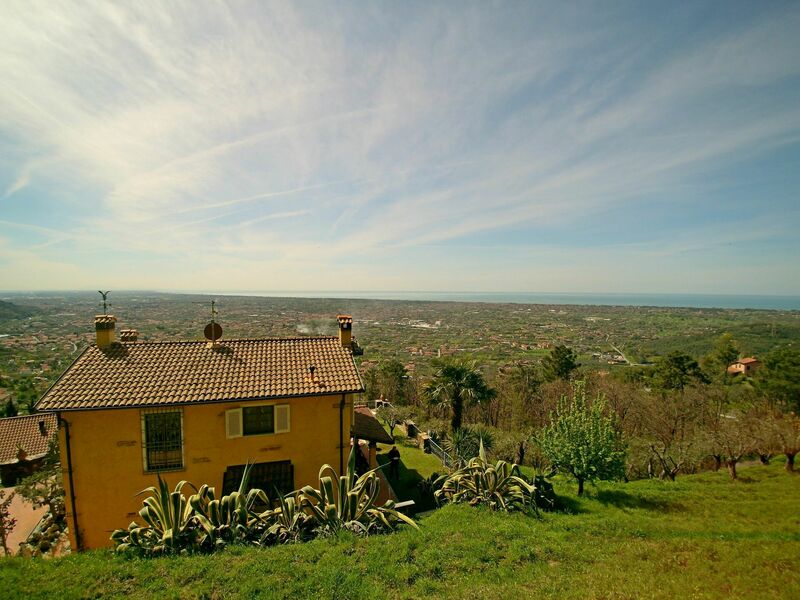 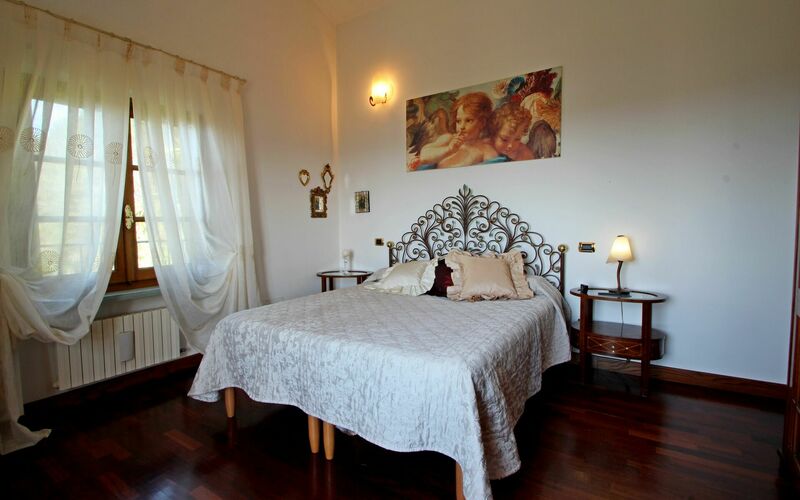 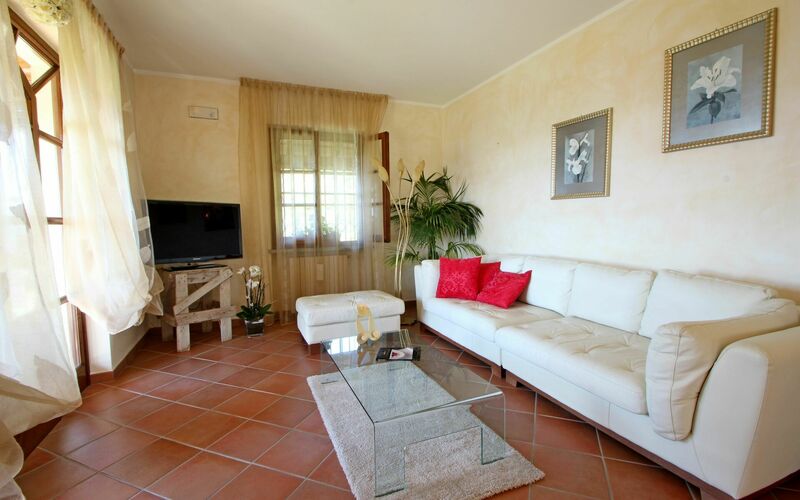 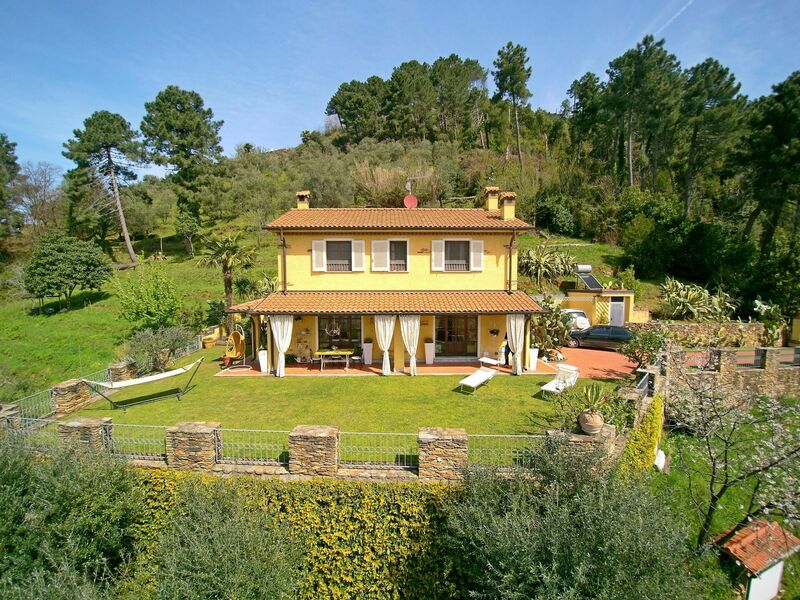 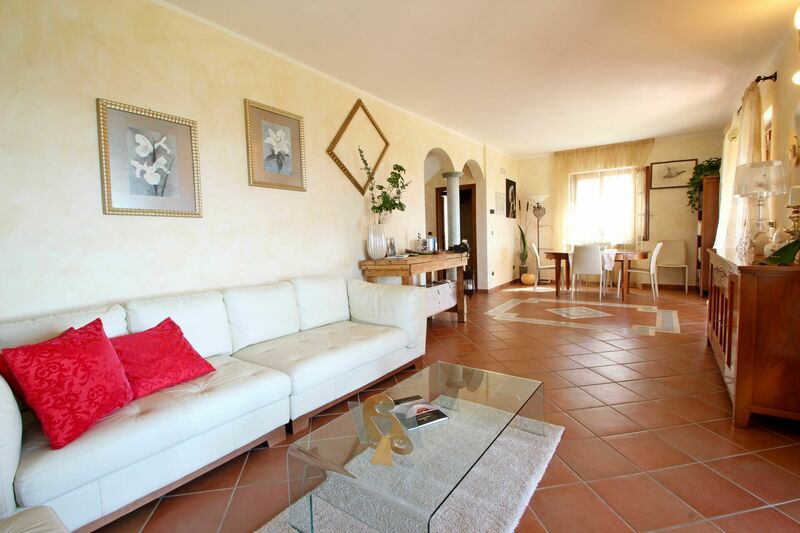 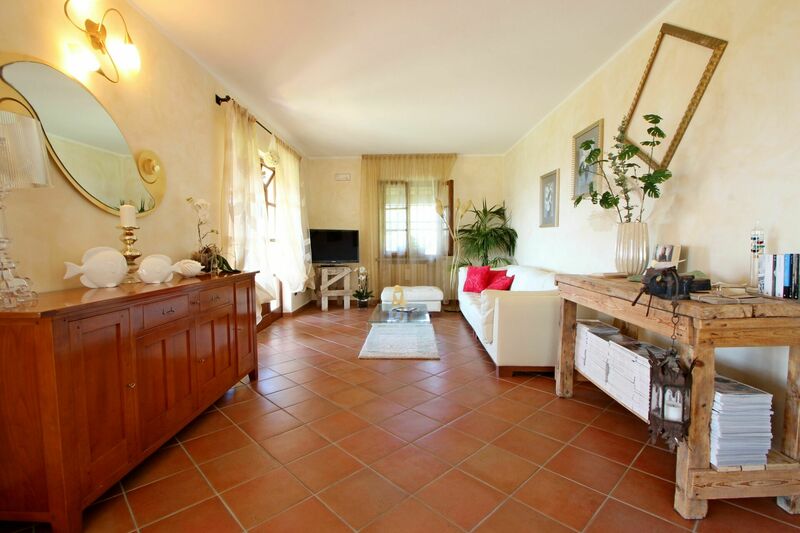 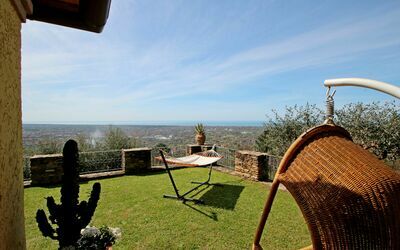 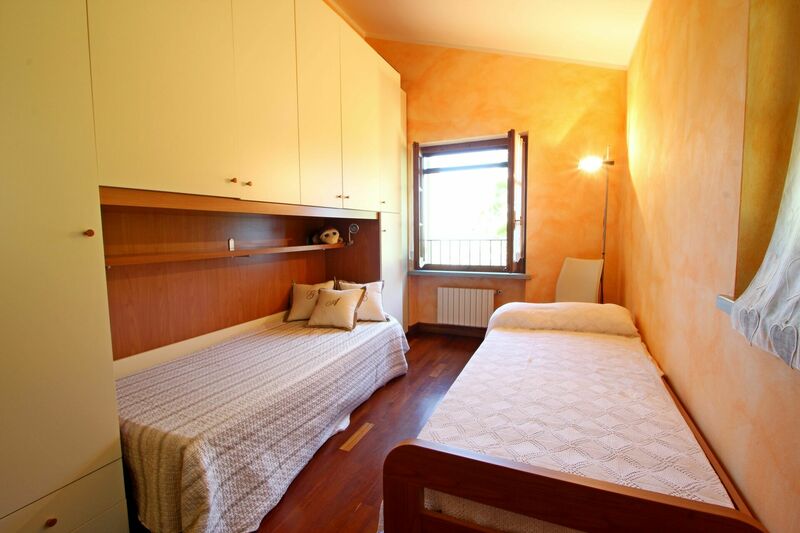 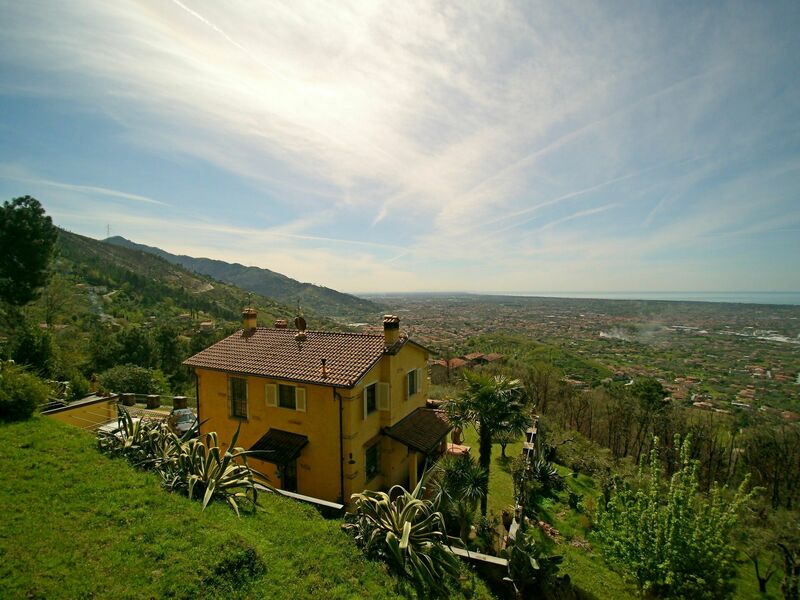 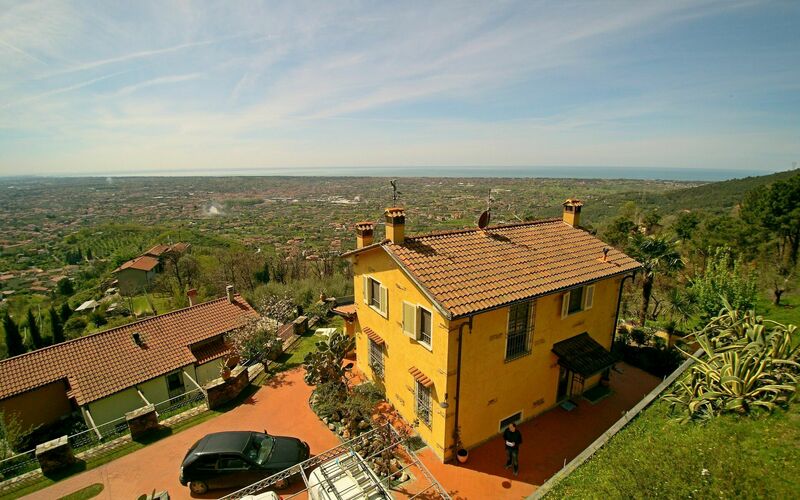 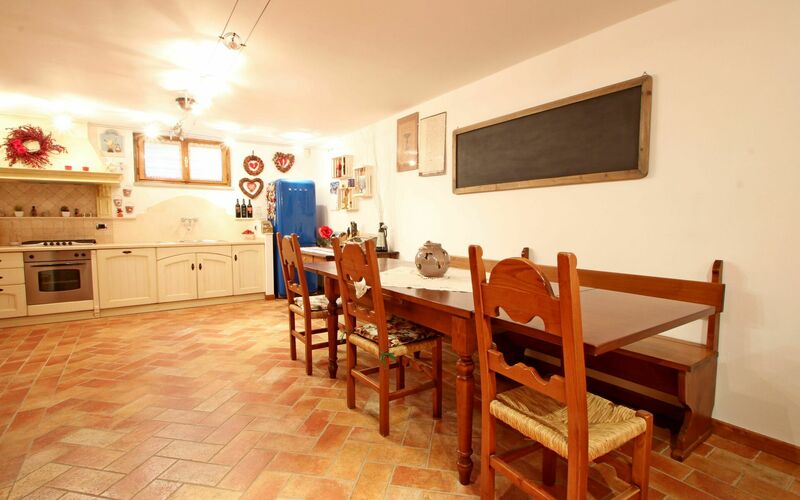 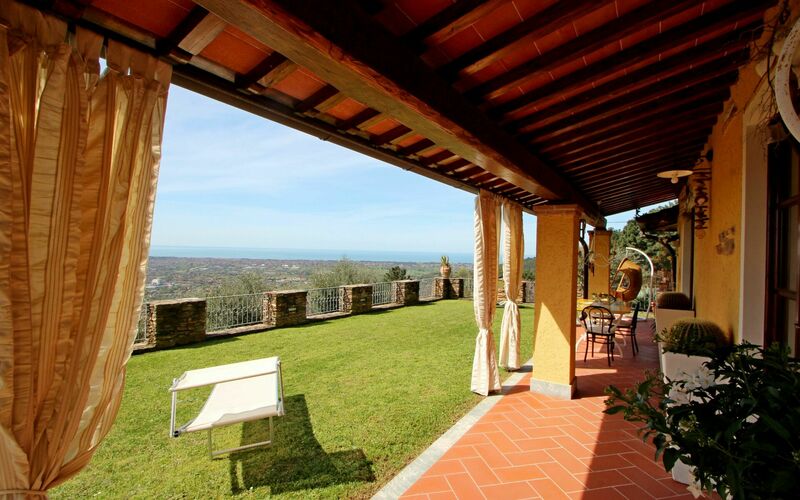 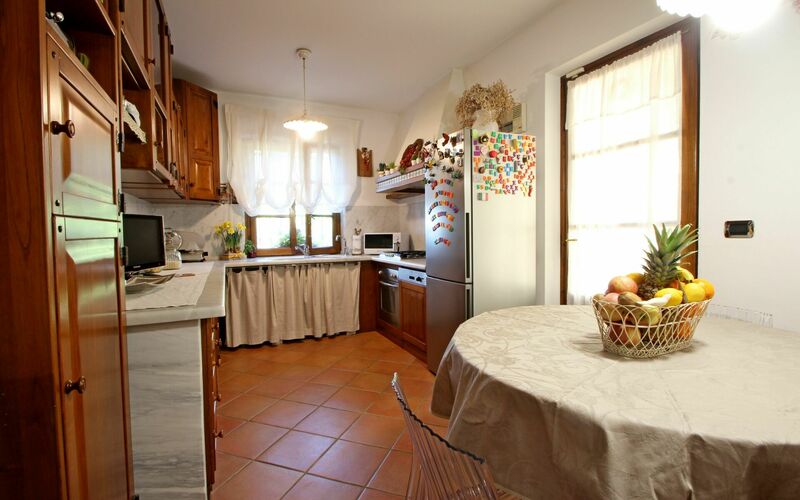 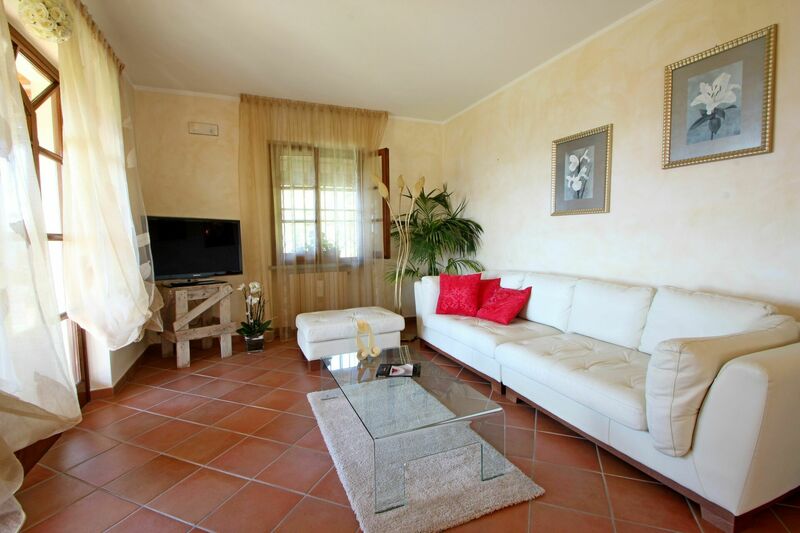 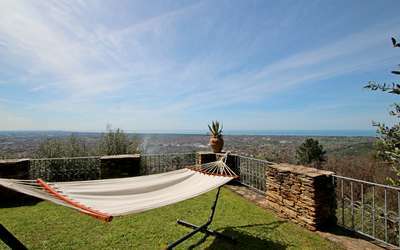 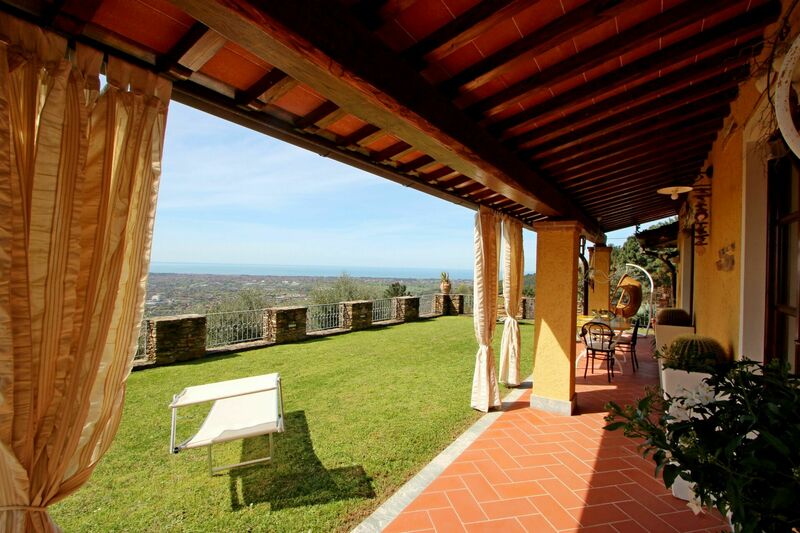 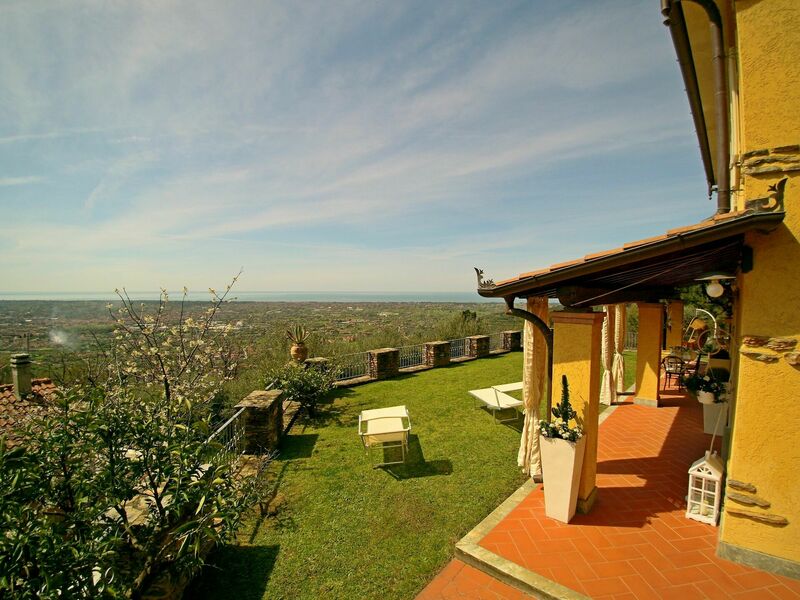 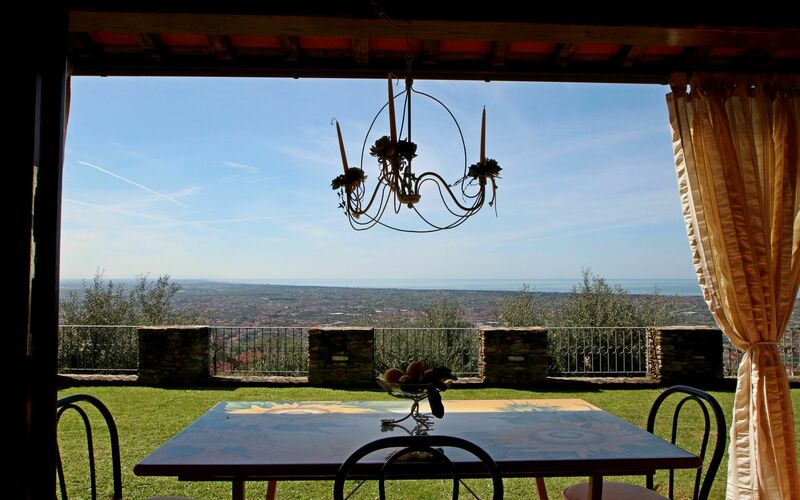 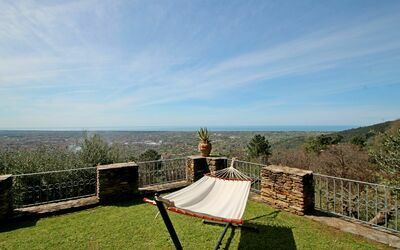 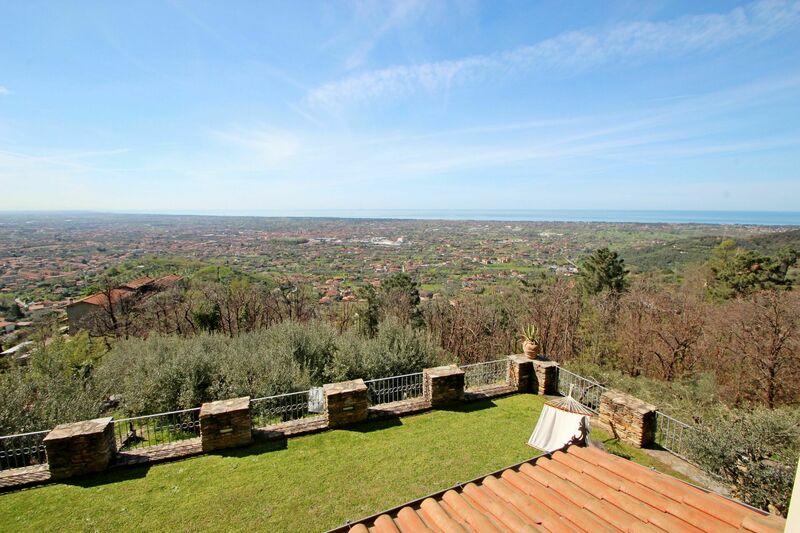 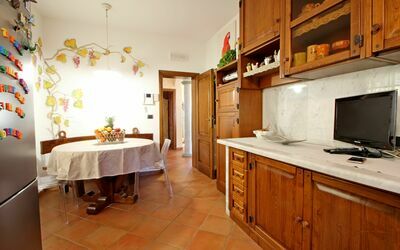 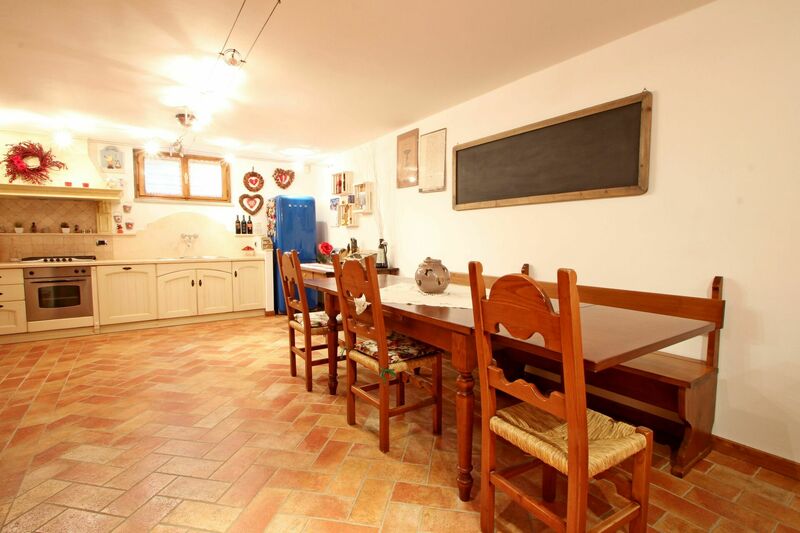 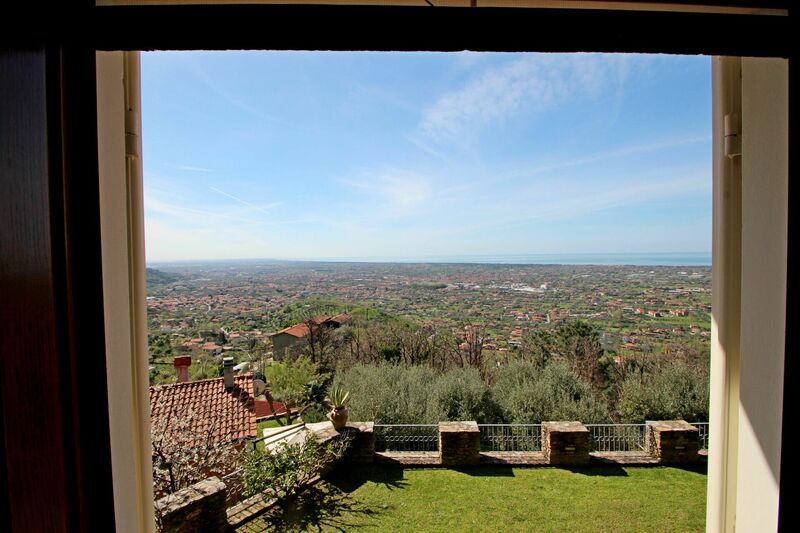 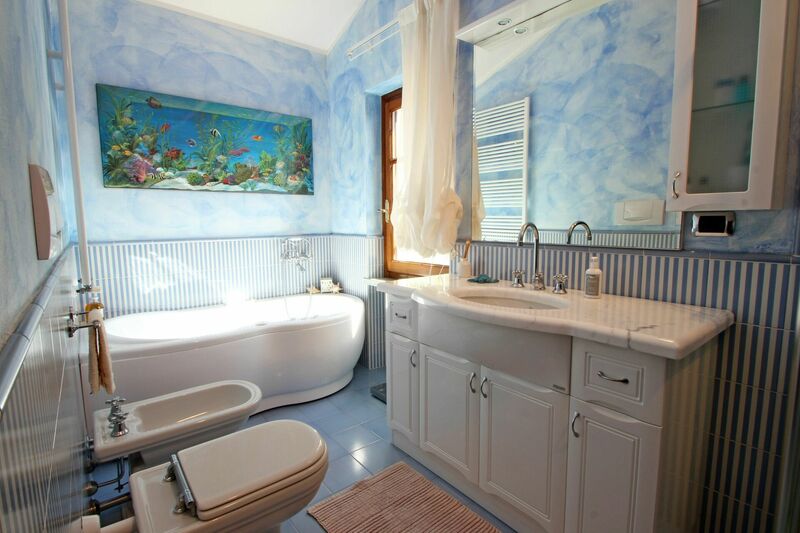 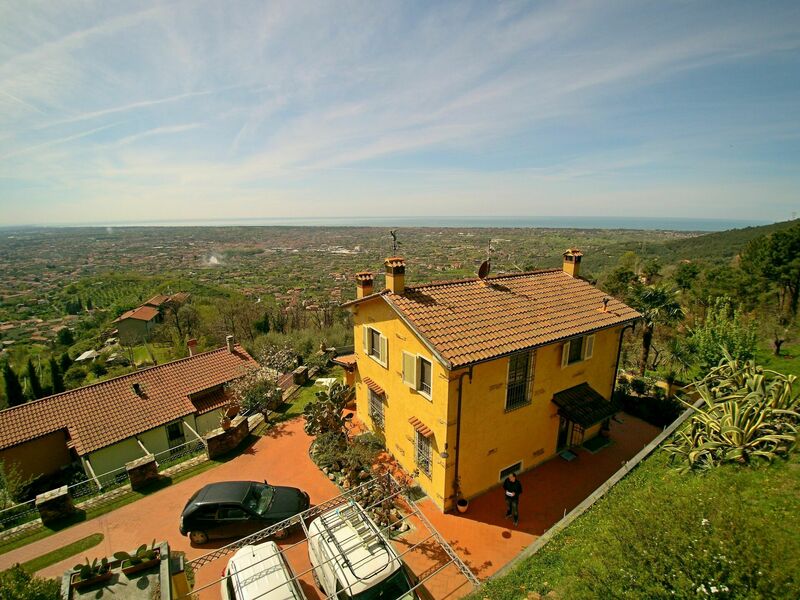 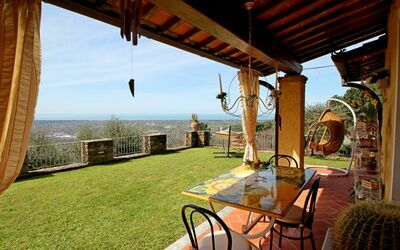 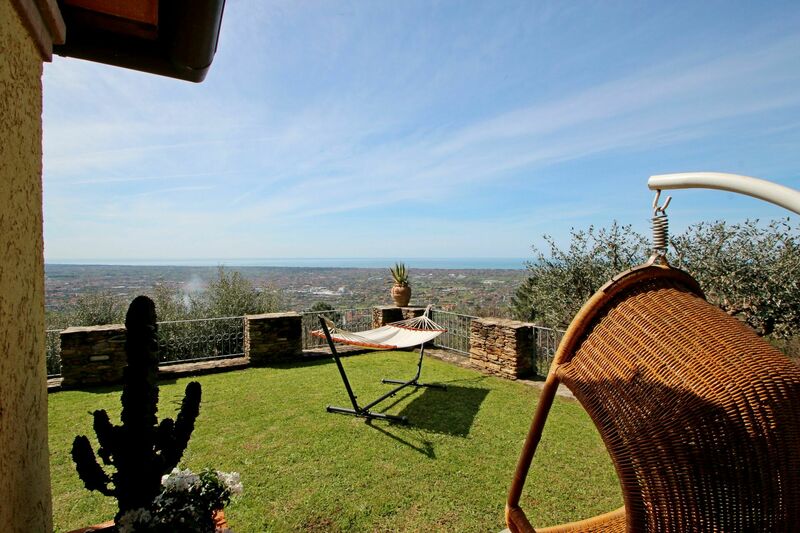 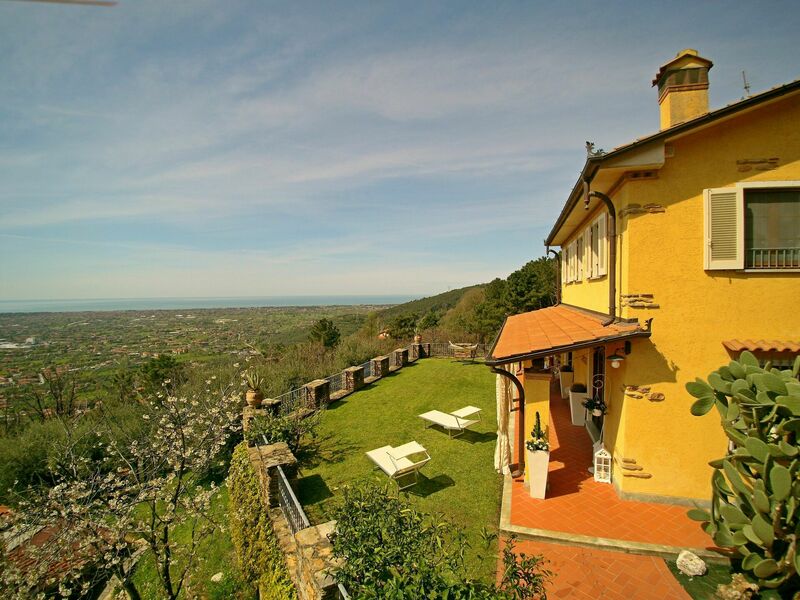 Holiday home for 7 people on the hills of Pietrasanta, behind Forte dei Marmi and about 6 km from the sea. 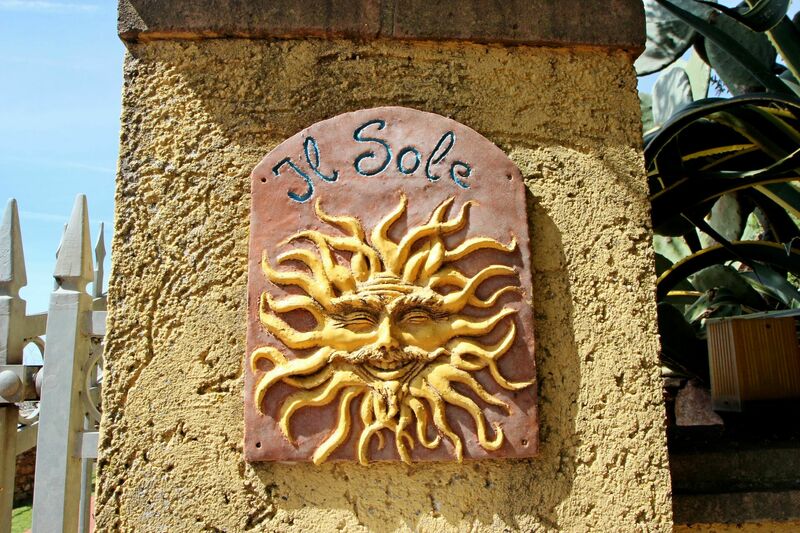 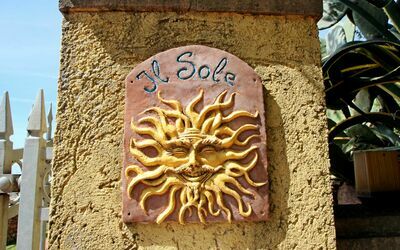 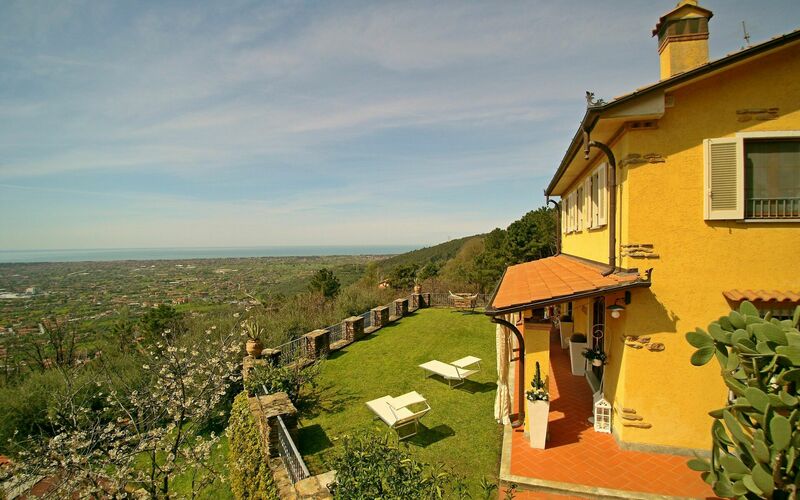 Driving a few hundred meters up the hill you find yourself in front of a wonderful sea view, and it is here where the holiday home Il Sole is located. 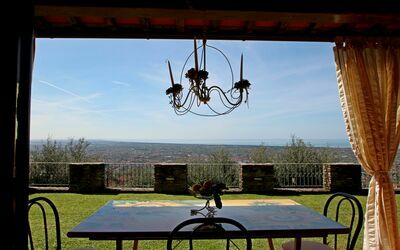 You pass through two gates and park the car in front of the house, at the private parking lot. From here you have a view of the coast from Marina di Massa to Livorno, and on clear days you can also see the islands such as Gorgona and Elba. 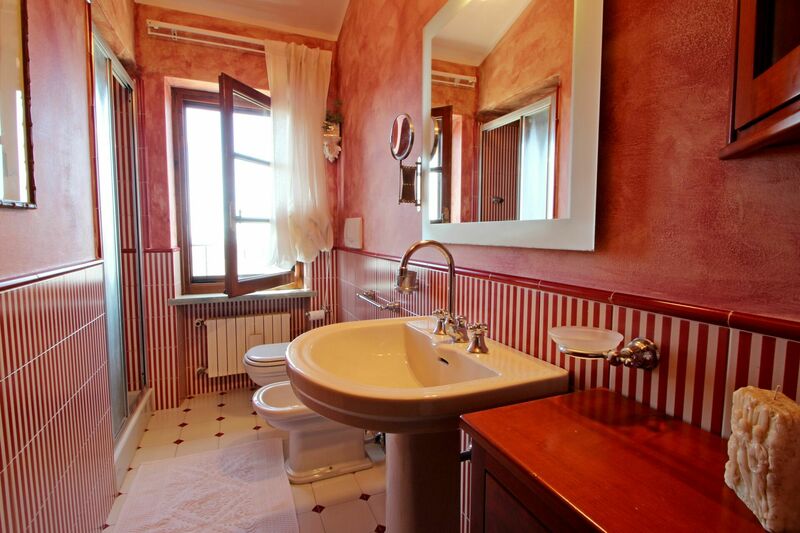 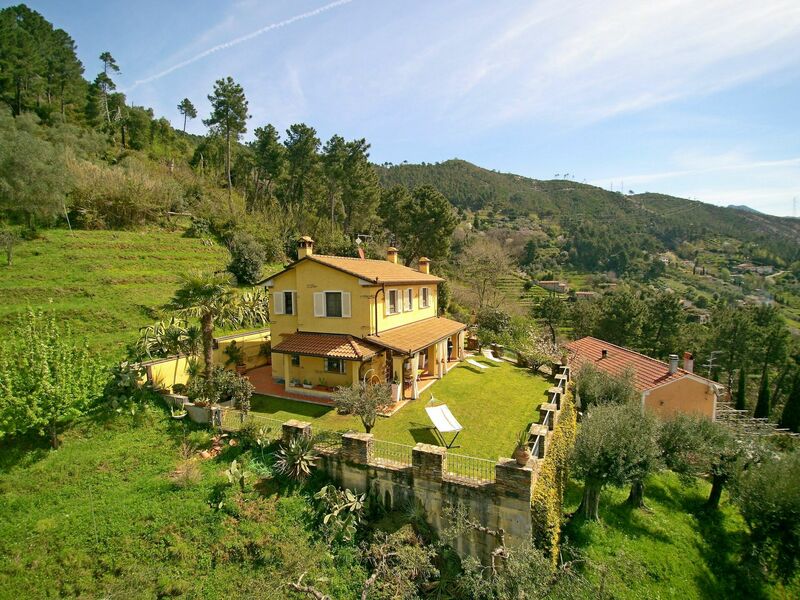 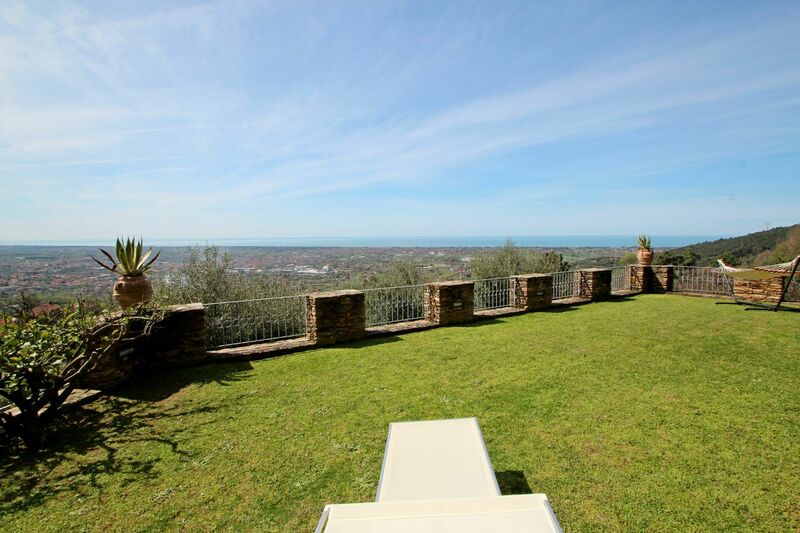 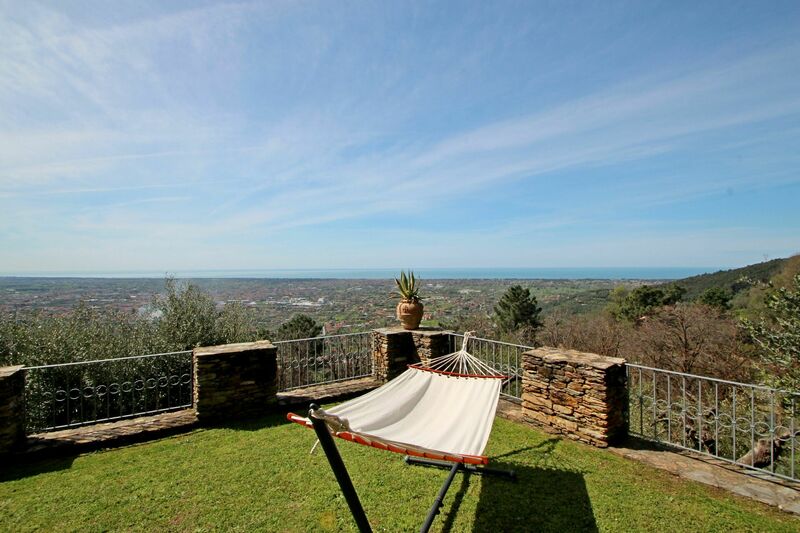 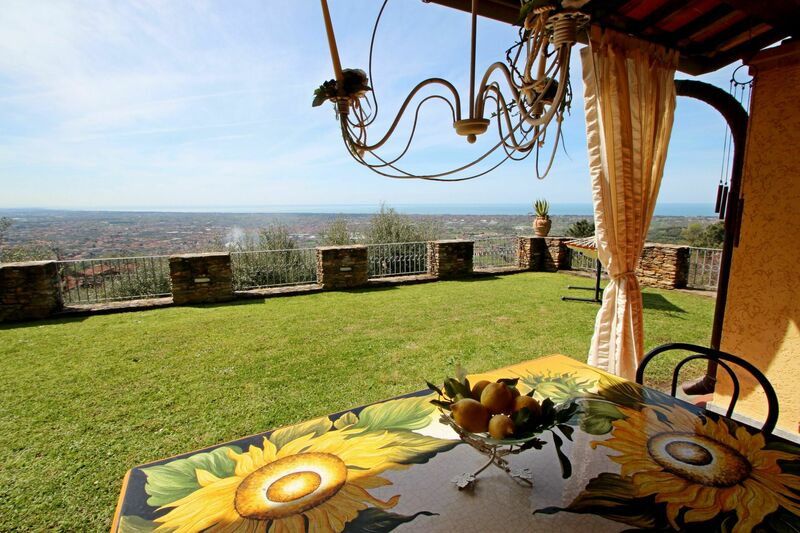 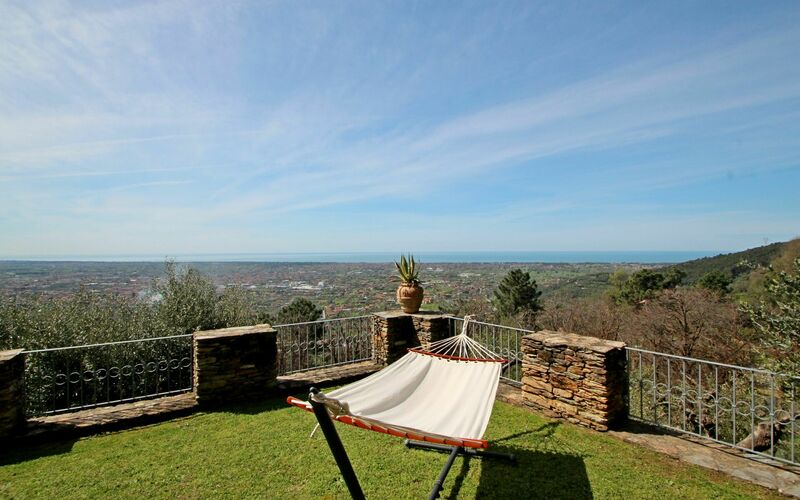 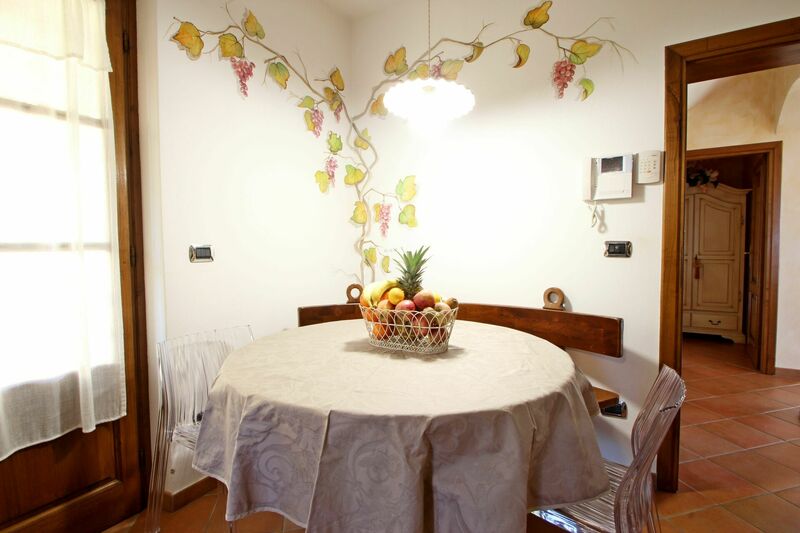 The house Il Sole is surrounded by a land of about 1000sqm, fenced and private for guests. 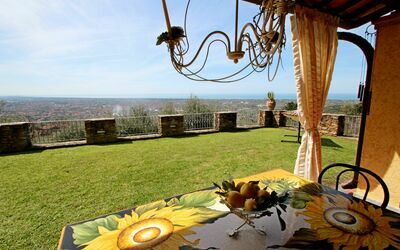 Here there are sun loungers, a covered veranda with table for outdoor dining, all with sea view. 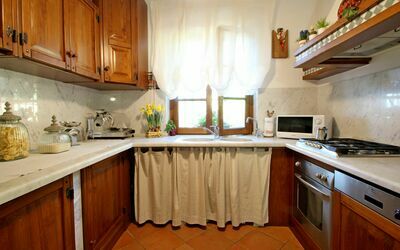 In a small outdoor room there is a washing machine. 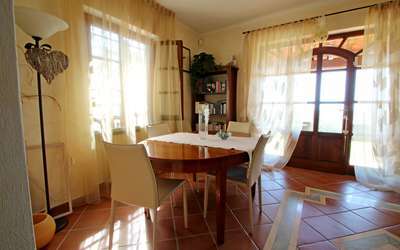 Below the house there is another property that is partly rented in summer. 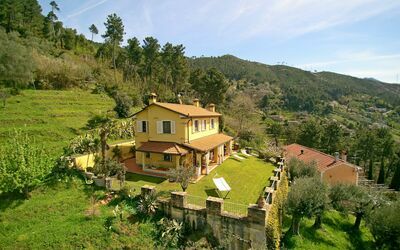 Important: The road to get to the house is steep, at certain points narrow and with tight bends. 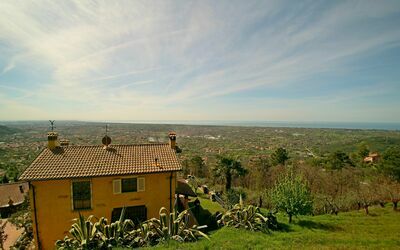 Use of utility cars is recommended. 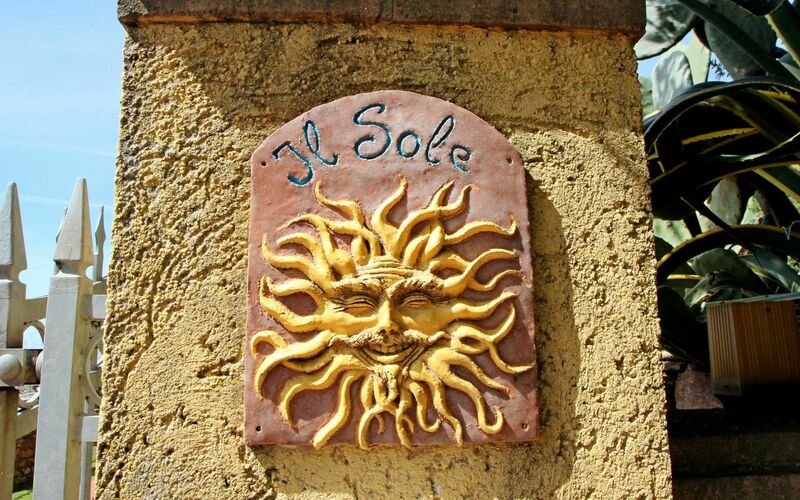 It is not suitable for buses or too low or large cars. Ground Floor: large living room with TV, sofa for 5 persons, dining table for 7 people and two glass doors with sea view. 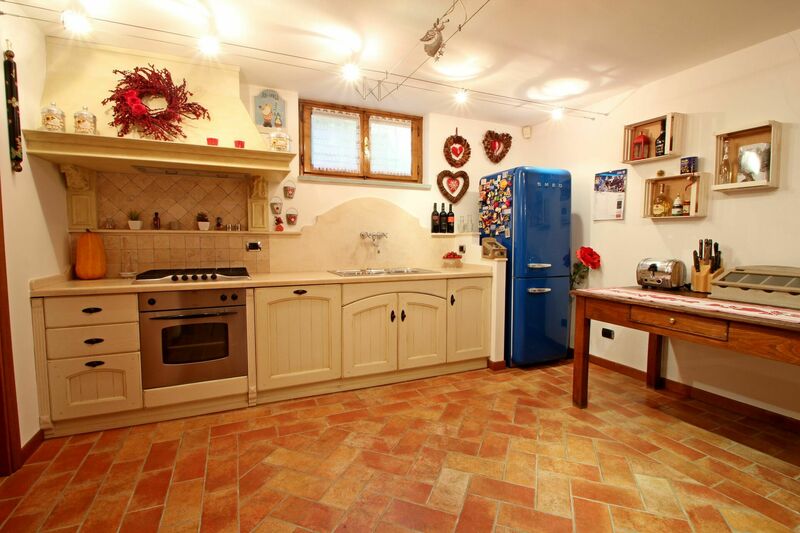 Well equipped kitchen with oven, 4 ring burners, coffee maker, dishwasher, fridge / freezer. 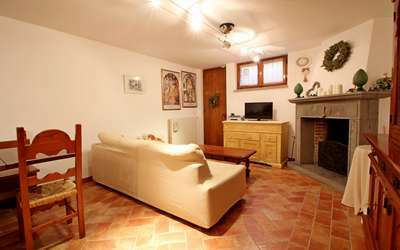 Basement: large living room with dining table, kitchen with 5 burner stove, dishwasher, oven, fridge / freezer, TV and sofa bed for 2 persons. Toilet. 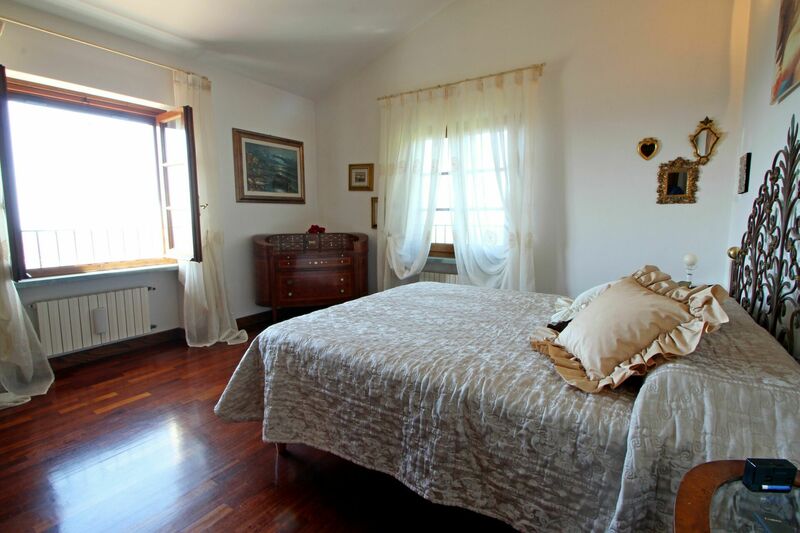 First floor: master bedroom with double bed, sea view, bathroom with toilet, bidet, sink and shower. 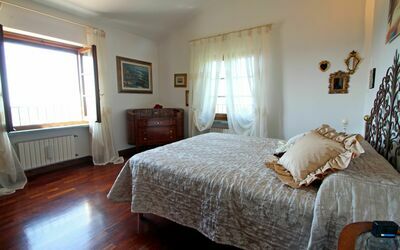 Bedroom with single bed and sea view. Bathroom with whirlpool tub, shower, sink, toilet and bidet. 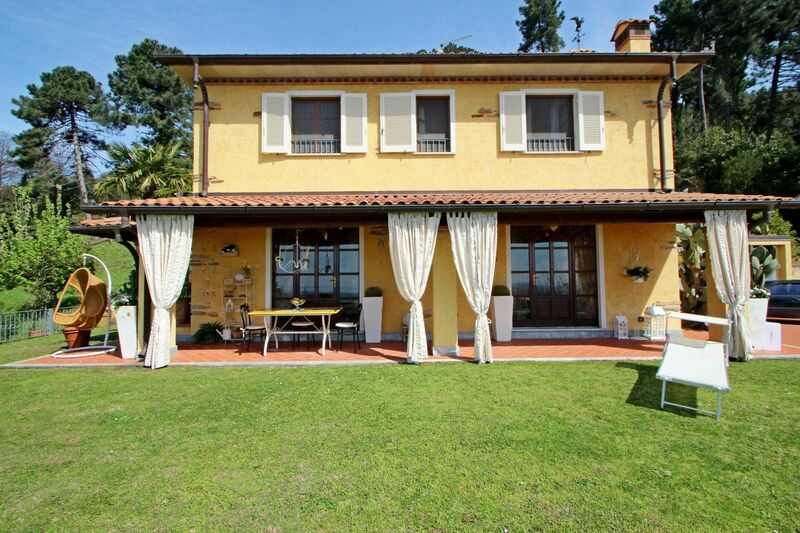 The house has WIFI and mosquito nets on the windows. 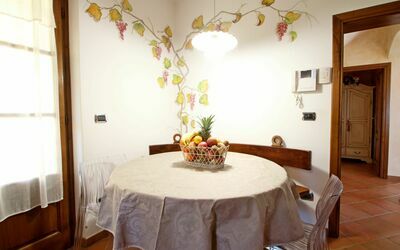 Sowohl das Haus als auch der Garten ist sehr exklusiv und komfortabel ausgestattet. Da sich das Ferienhaus ganz oben auf den Hügeln von Strettoia befindet, ist die Aussicht grandios. 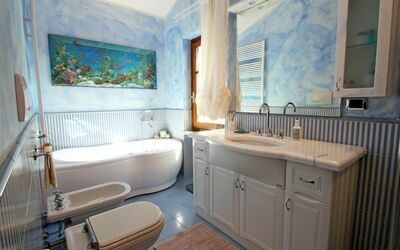 Es gibt 2 Bäder mit Duschen, davon eines mit einer zusätzlichen Badewanne. 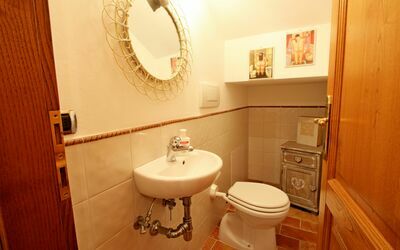 Zusätzlich gibt es im Erdgeschoss und Keller je ein WC. 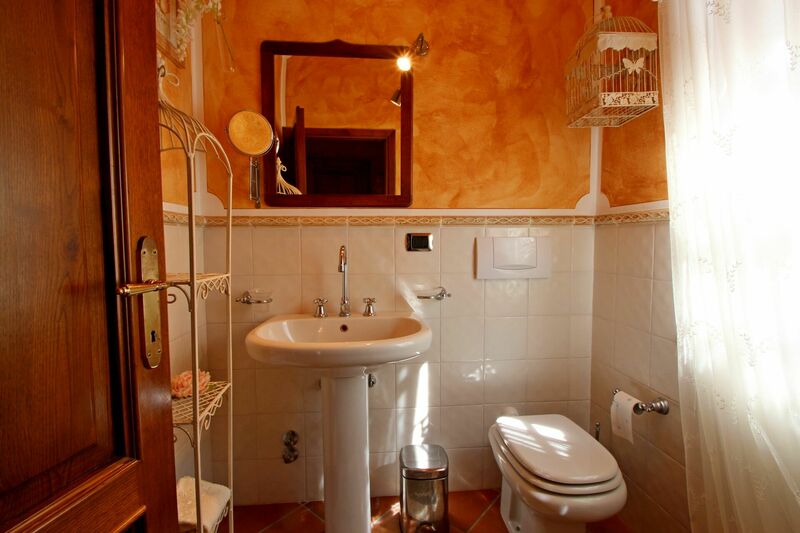 Sowohl im Erdgeschoss als auch im Kellergeschoss gibt es eine vollausgestattete Küche. 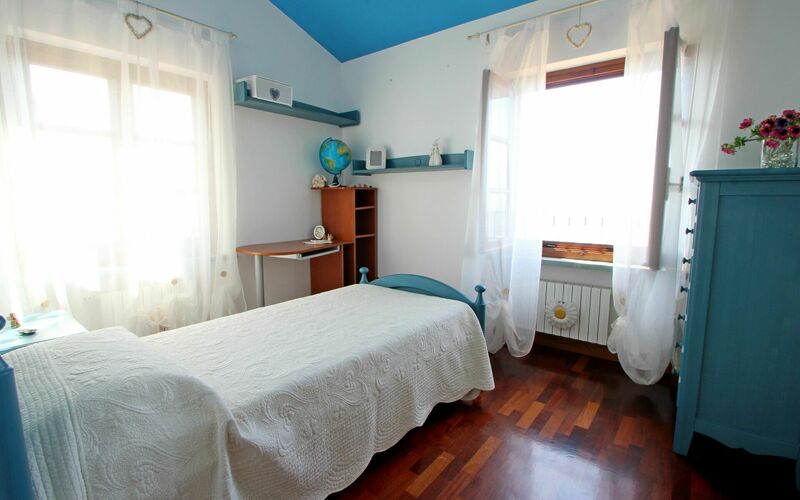 Ein Schlafzimmer hat ein Doppelbett, ein Zimmer hat zwei Einzelbetten, das 3. 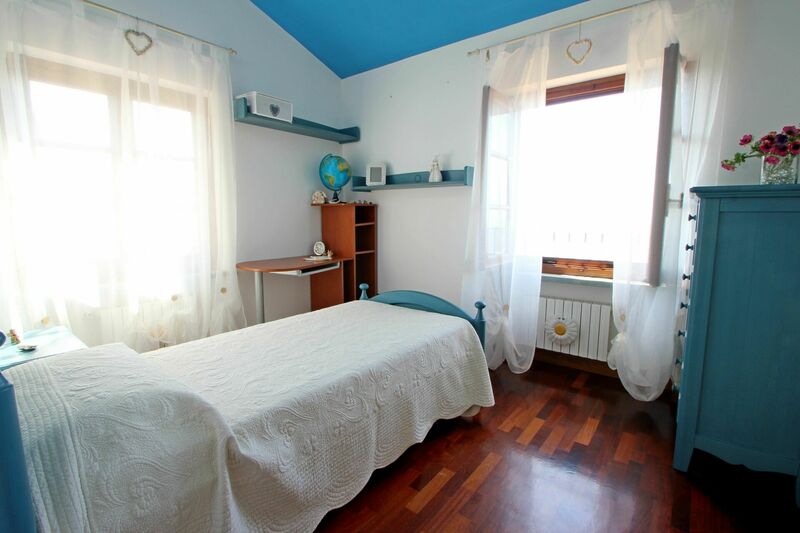 Schlafzimmer hat ein Einzellbett. In der Wohnküche im Kellergeschoss gibt es eine Schlafcouch, die wir allerdings nicht genutzt haben. Die Matratzen sind sehr komfortabel. 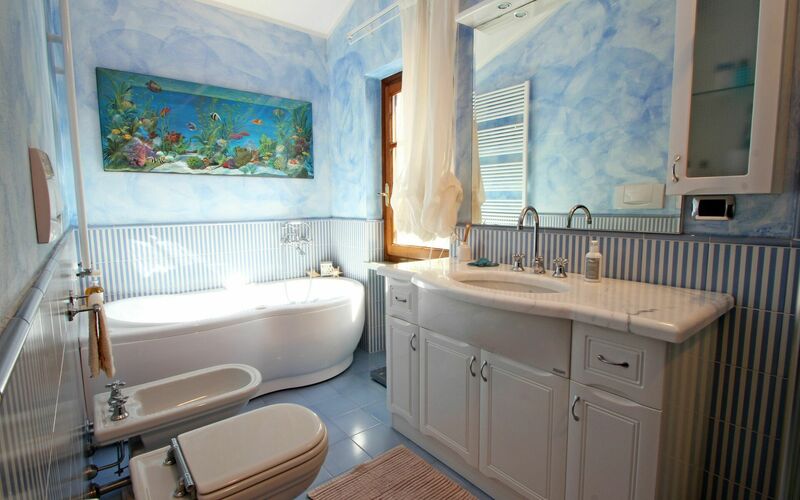 Die Außendusche mit Kalt- und Warmwasser wurde regelmäßig von uns genutzt. 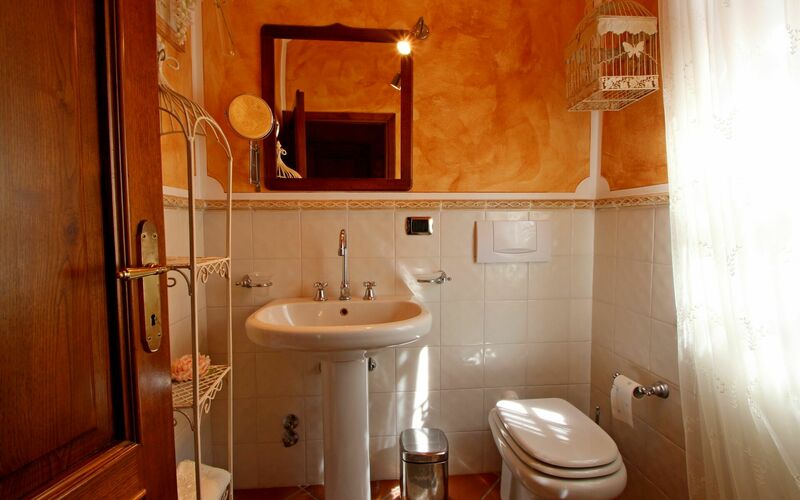 Die Vermieter sind sehr hilfsbereit. Die Kommunikation erfolgte über Google Übersetzer. Der letzten 50 m. Fahrstrecke erfordern Bergerfahrung, zumindest wenn man ein größeres Fahrzeug (in unserem Fall ein VW-Bus) benutzt. 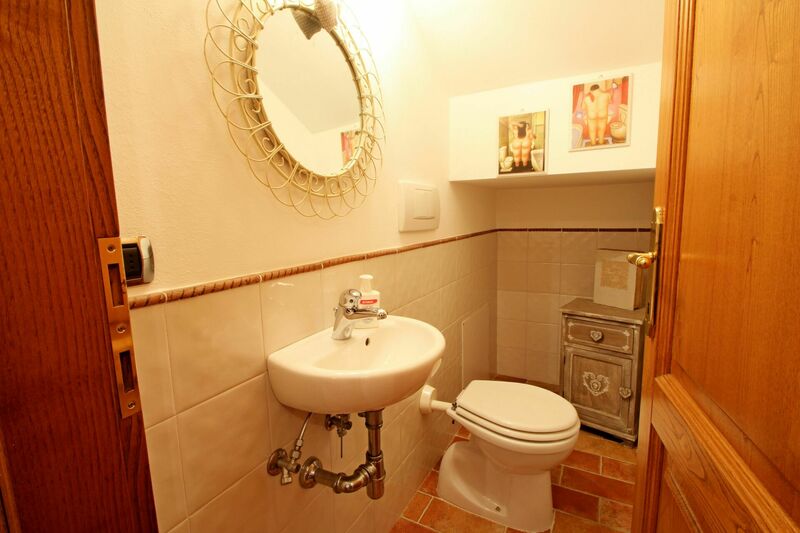 Wir mussten in einer Kehre rangieren. Für kleinere Fahrzeug ist die Kehre sicherlich kein Problem.